Are you not happy with your back muscles? Many of us spend several hours in the gym or train for long hours but are still not able to achieve thick and strong back muscles. Though diet and training well play an important role, the exercises you select should be able to target some common weak spots and tone your overall muscles. You should also focus on building muscle mass as you concentrate on your back muscles. Our back is about big muscle groups and as you train, it is important to focus on all the muscles. We have a combination of exercises which might help you in achieving your dream muscles in a short time. This is a common exercise which you should ideally include in your daily workout routine. You need to set the adjustable bench at an angle of 30-45 degrees. This shall be set as per your body comfort level and changed later on too. You will lie on a chest down position. Now, slowly hold on a dumbbell in your hand and slowly bring your shoulder blades back and together. You need to row the weights by your sides. You will carry out this movement at least 10-12 times. You will feel a good stretch in your back muscles which means you are working them out well. Lat pulldown is a powerful movement which is known to be very effective in building muscles. Bodybuilders are known to rely a lot on this workout for strength and flexibility. You will start by sitting down in a lat pulldown station. Hold the bar firmly with a strong overhead grip. Your grip shall be much beyond the shoulder width. You will not move your torso but you need to slowly move the shoulders a little back and down. You need to bring the bar close down towards the chest. In this position, you need to pause for some time and get back to the start position. You will feel how your lats are working out with every repetition. You need to repeat at least 8-12 times. You also need to ensure that your upper body is in the same position as you start the workout. This is an interesting exercise which builds strong and thick back muscles. Beginners who are trying to struggle with poor muscle mass or lack of flexibility usually find this workout quite effective. However, if you are just starting out at the gym, you need to do this workout, under the supervision of an expert. You need to add one weighted belt to the waist. Now, hold on a dumbbell just between the feet. 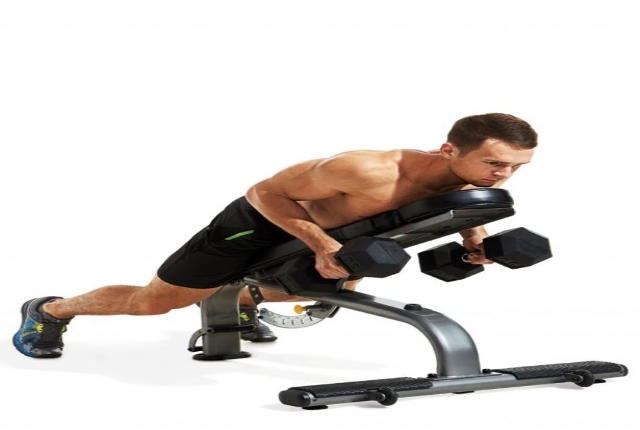 In case you feel it is extremely difficult to do the workout with weight, you need not use it as you start. You will then hang carefully from a pullup bar. Your hands need to be just outside the shoulder width. You can also pull yourself up till your chin is up above the bar. This exercise is especially helpful for those who spend several hours at the desk. You need to hold on a barbell with the help of an underhand grip. This should be just a little beyond the shoulder width. You need to hold on to this position as your arm’s length. You can slowly lower the torso till it is parallel to the floor. You will bend your hips and the knees. Allow the bar to hand from your arm’s length. Now, slowly pull this bar towards the upper abs. This will be a difficult movement as you start working out. Be careful not to injure or exert too much. You will slowly squeeze the shoulder blades together as you do this movement. Now, stop for a few seconds and then again lower your back and get back to the start position. You need to this movement 5-6 times as you start working out. This is a simple exercise which offers amazing results. You will need a trap bar for this workout. Stand as you keep your feet some distance apart from one another. You will slowly bend your hips a bit back. Hold on the handles firmly. You will have your lower back in a natural arch position. Now, move through the heel and try to stand straight. You will extend your hips and your knees in this position. Move slowly without any pressure. Repeat this movement at least 8-10 times but if it is painful you can stop in between and start again later on.